The Ganges Brahmaputra Delta, also named Ganges Delta, Sunderban Delta or Bengal Delta is situated in Asia where the Ganges and Brahmaputra rivers discharge into the Bay of Bengal. It is, with a surface area of some 100.000 km2, the world's largest Delta. Approximately two-thirds of the delta is in Bangladesh, the rest constitutes the state of West Bengal, India. The Ganges Delta is the floodplain of three great rivers: the Ganges, the Brahmaputra and the Megna. Together, these three rivers drain a catchment of about 1.72 million km2, at the southern side of he Himalaya. 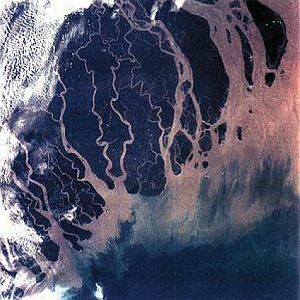 The Ganges Delta is among the most fertile regions in the world. Along the coast, he width of the delta is approximately 350 km. The distance from the confluence of the Brahmaputra and the Ganges to the coast is some 250 km. Downstream the confluence, the river is named Padma. About halfway the Padma, the Meghna joins. With some 130 million inhabitants, the Ganges delta belongs to the most densely populated areas in the world (1.300 inh/km2). Source: Prof. dr. H. de Vriend, Deltares (Delft, January 11, 2009), Towards sustainable development of deltas: Aquaterra research on trends and responses.